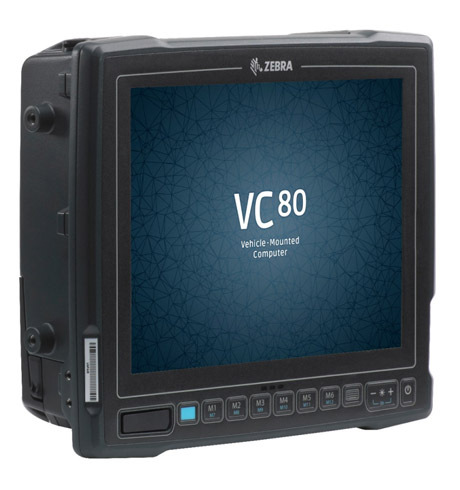 Whether on a forklift, truck or heavy-duty crane, use the Zebra VC80 everywhere where heavy machinery users require real-time logistical information. Thanks to its highly robust construction the flexible vehicle terminal defies all weather conditions, whether in indoor halls or outdoors. Certified according to IP66 standards, the VC80 repels liquids and dust. Its strengths are particularly highlighted in outdoor storage, railway transport in airports and harbors. Even freezer environments optionally belong to its favorite operational environments, thanks to intelligent heating elements, so that the VC80 is not affected by frost and condensation. The 10.4” resistive touch monitor ensures for a clearly arranged presentation of real-time data, and is optimally readable even in direct sunlight, thanks to a brightness of up to 1,000 Nits. As needed, six freely programmable keys expand the touch screen for even more efficient operation. Choose between a dual core and quad core processor with 2 GB each or 4 GB RAM for scalable performance. You also have your choice between various Windows operating systems.